Welcome to the $100 Christmas Cash Giveaway! 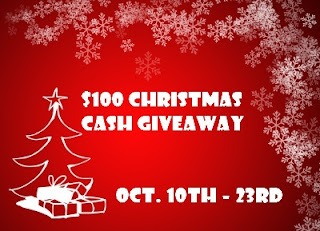 One lucky winner will get a head start on their Christmas shopping and have $100 deposited directly into their Paypal account. This giveaway is sponsored by 20 awesome blogs. To enter, simply follow each of us via Google Friend Connect (GFC) using the Rafflecopter form below! Giveaway starts 10/10 at 12:00 am EST and ends 10/23 at 11:59 pm EST. You only need to enter the giveaway on one of our blogs, but you can come back once a day to claim your daily entries too!